Home BOLLYWOOD Sarkar 3 Trailer Out: Angry Amitabh Bachchan Is Back With A Vengeance! 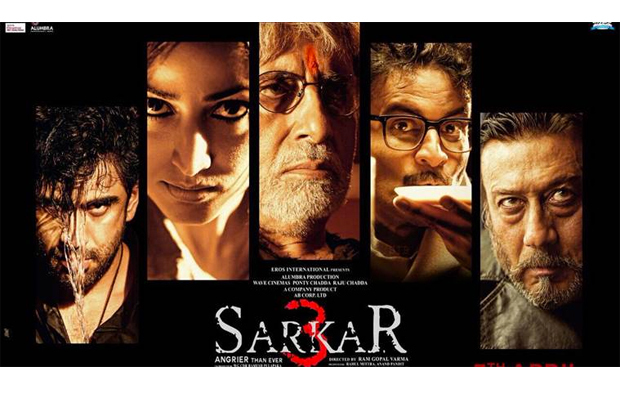 Sarkar 3 Trailer Out: Angry Amitabh Bachchan Is Back With A Vengeance! The much-awaited Sarkar 3 trailer is finally out and it’s intriguing! Ram Gopal Varma’s Sarkar 3 sees Amitabh Bachchan back and angrier than ever as Subhash Sarkar Nagare. A character loosely inspired by the real-life political figure Balasaheb Thackeray. The trailer opens with a strong tagline, “A wounded lion, is the most dangerous, which indicates that Amitabh Bachchan in the film is all set to take revenge for the death of his son Shankar (Abhishek Bachchan). One can’t help but stay glued to the seat throughout the trailer. Amitabh Bachchan has nailed it and is seen in a beyond powerful and intense role. Moreover, it’s great to see that the makers of the film have not made any changes to Big B’s personality or look in order to keep the character connected to the audience in the 3rd series of the hit franchise. Amit Sadh’s rebellious character is interesting while Yami Gautam is a surprise package and has pulled out the role fantastically in the trailer. Manoj Bajpai. Rohini Hattangadi, Amit Sadh, Yami Gautam, Supriya Pathak, Ronit Roy and Jackie Shroff have been perfectly fit in the trailer and make the film worth watching. The background score “Govinda Govinda” reminds us of the earlier parts of the film and brings back the mood to watch this political thriller. The trailer looks impressive and now it remains to see if the film promised the same feel in the theatres or no. Sarkar 3 will release on April 7. Next articleSushant Singh Rajput And Jacqueline Fernandez Go On A Drive And They Look HOT!